I was given an opportunity to try out La Roche-Posay new product Cicaplast Balm B5. I was pretty excited to try this product out as I suffer greatly from dry and cracked skin especially on my heels and elbows (not to mention the eczema all over!). Cicaplast Balm B5 is designed to speed up the recovery of the skin from irritations, cuts and cracks. It can be used all over the body – even your lips! I loved the fact that it was paraben free, fragrance free and lanolin free. It is safe enough to use on infants and children. The perfect family product! No more buying different creams for different family members. Awful isn’t it? I am cringing as I am uploading and looking at this awful picture! I suffer with cracked heels all through out the summer made worse by the love of my sandals that have little to no support. I used the balm for just under two weeks, applying daily. I was really impressed with the rich texture of the cream and its quick absorption. You only need a small amount and it feels as though it creates a protective barrier over top of the skin. I could feel the difference in my heels within four days. Not only did they feel softer but the cracks were healing (which was a first!) and no more sandpaper sounding feet rubbing at night (my husband was grateful – he could not stand the noise!). Pretty neat, eh?! I will definitely be purchasing this in the future! Disclosure: I received a trial product at no cost but the opinions expressed are my own. 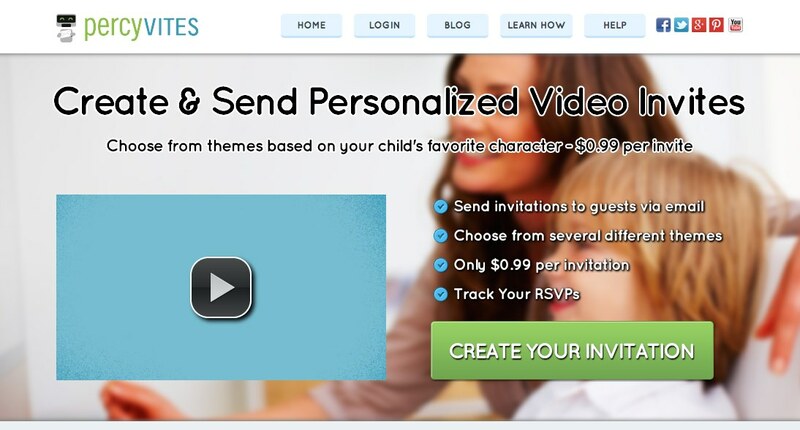 Recently I was given the opportunity to try out the PercyVites website and create my own personalized e-vites. 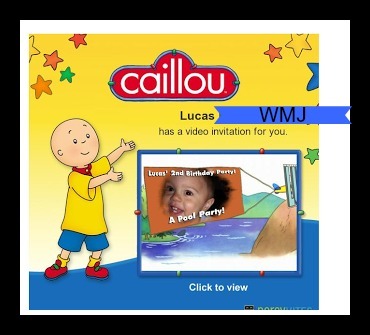 I was really excited to be able to participate in this opportunity through PTPA Media and even more so because our son’s second birthday was coming up! I love birthdays and parties – to be very honest I love any reason to celebrate and be given the opportunity to plan and organize a party. I love the thrill of choosing a theme and carrying it out from start to finish. Both my husbands and my own family are scattered all over Ontario and through out several continents so it is not feasible for us to be able to mail invites to each and every person we want to. This usually results in us sending out a text message to family close by or an email if needed. I can not even begin to describe how much I hate doing that – I love invitations as they set the mood and excitement for the party to come. 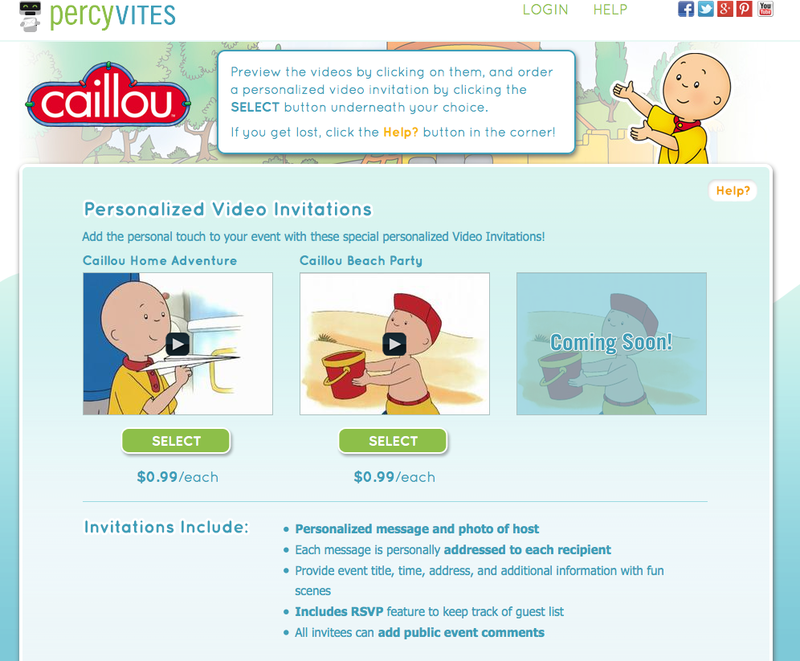 PercyVites are unique personalized video invitations that are delivered to your invitation list by email. 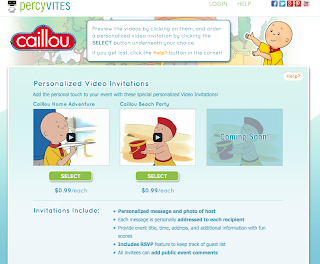 They incorporate popular licensed characters into a video clip with your child’s photograph and all relevant party information. I loved how simple the site was to navigate through. My two year old and I sat down and he had to have Caillou! So we made our choice and quickly began to go through the pages to set up the invite; choosing our event date, details, email addresses, etc..
We were able to send them out to everyone in our family, including our family that live overseas! This was a first to be able to include them and they were very grateful for this. 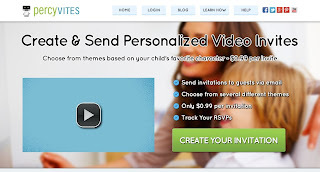 We had such rave reviews from everyone that received an e-vite. They had never seen something so neat and interactive before. They loved how his picture was included and the whole video clip in general. PercyVites site was easy to navigate and enter the information. At $0.99 an invite you can not go wrong! They are eco-friendly! No wasting paper and they save you money on having to purchase stamps. I loved the personalization. It was nice to know that each person that received an invite felt included and welcomed. My child’s image was included in the invite! 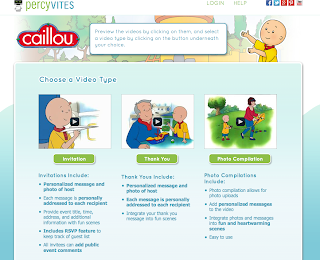 He loved being in a video clip with Caillou! PercyVites have been awarded the PTPA seal as well! Very well deserved! You can follow them on Twitter, Pinterest and Facebook. 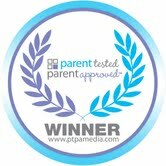 Have you signed up yet to be a parent product tester with PTPA Media yet? If not sign up here now! I recently won a bottle of Mela-D Serum from La Roche-Posay from their Twitter giveaway. I was super excited to try it out! Having just had my youngest son about a year ago and the various hormonal changes that go along with that as well as PCOS, my skin has suffered greatly in certain areas. I have developed darker spots along my jaw line and cheeks which I try to cover up as much as possible. Before I began to use the product I looked up some info on it. Mela-D serum is hydroquinone free! Which is great as it has been banned in many countries as it can not be ruled out as a possible carcinogen. What it does contain is: Kojic acid, Glycolic acid and Thermal dermobiotic (info from the La Roche-Posay website). Kojic acid is derived from fungi and helps in reducing the look of dark spots. Glycolic acid is an exfoliating agent helping to remove the dark skin cells. When I received the serum it also came with a dropper (I have never used a serum before so this was all new and pretty cool to me!). I test tried it over a period of two days on the skin around my elbow as I have olive skin that is pretty sensitive and tends to react easily. I had no reaction so was excited to try it out on my jaw line and cheeks. I found the serum itself to be non oily and thick enough that you can put a small amount on your fingertip and it will not roll off. It has a mild to moderate strength smell that is not unpleasant. It did not irritate or make my skin tingle when I put it on. The product comes with instructions to use at night, after cleansing and moisturising your face. I used the serum for just over two weeks (I am still currently using it) and have noticed a slight improvement of the uneven skin tone and darker spots around my jaw and cheek areas. I am going to continue to use it for an additional three months as I am impressed with the slight improvements that have occurred and would like to continue to see these improvements! I would recommend this product to anyone with mild to moderate uneven skin tone and dark spots (as that is how my skin is currently) and also to olive toned and sensitive skin individuals (as with all new products test try on a patch area away from you face!). And as the product recommends always use sunscreen during the day as your skin can become sensitive during usage.